Alexis is a preschool teacher who lives at home with her parents, and spends the majority of her time with her seven-year-old cousin, Seattle; while Nathan is an ambitious intern who longs to see the inside of an operating room without the shadow cast by his brilliant, doctor-filled family. But when an accident throws the two into a strange world called Alexithymia, where their quiet nights and surgeries are forgotten and nothing seems to make logical sense, it's going to take a lot more than finger paint and scalpels to get them back home again..."
Published proudly under her real name, Alexithymia is Dani Lowman's second indie novel. Combining her love for art and her well-established passion for words, Alexithymia boasts front and back covers that were illustrated by Dani herself - originally with acrylic paint on canvas. Available now for purchase from CreateSpace and Amazon! Get your copy today! "Alexithymia is a story where two people under normal circumstances should never have met. But it only took one non-normal moment to change that. and find yourself wanting to book a ticket to the wondrous world of Alexithymia. and the adrenaline provoking sections, you truly will not regret the purchase. Have enjoyed all that Dani Lowman has offered and looking forward to stories to come." "This book takes you from the earthly dimension that all humans actually know and experience, to another dimension of creative, thought-provoking huge imagination. While reading, you get the distinct impression that this author is spiritually in tune with something way beyond herself and she takes us to a place of gratification knowing that 'all is well--and we are always alive somewhere'. This read caused me to think about the fact that no matter how bad things get in our life, there is always a living hope that can arise in us and bring about fulfillment. I read tons of novels, but I can honestly say this book is the most stimulating and thought-provoking books I have read. YOU MUST READ IT!!! It is one you will remember and talk about." "Dani Lowman made me feel like I have lived in the world of Alexithymia for years. Once I started to read the book, I felt like I was a part of Alexis' family and I didn't want that bond to have to come to an end. 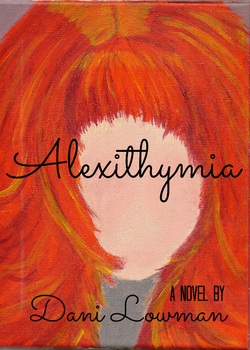 Alexithymia is definitely a must read, taking your emotions on a rollercoaster as you journey through the book with Alexis' family & doctor-intern. Be careful though, because once you start Alexithymia, you won't want to put it down. I can't wait to see more from this author!" If you're within a mile radius of the ever-fantastic Georgia Lynn Freebird - you're likely to fall into the last category. With eyes that won't stay one color, a vivid and permanent memory, and a mouth that won't stay closed, Georgia tends to find herself in uncomfortable situations... and the physical inability to tell even the smallest lie makes the appearance of a new, attractive man in her life that much more difficult to handle. Georgia may not have the luxury of a conventional or comfortable life, but being strange is the best and worst part of being born a true Outsider. Open your eyes and heart to a whole new way of being human, and pretty soon you may find yourself wishing you'd been born an Outsider, too." 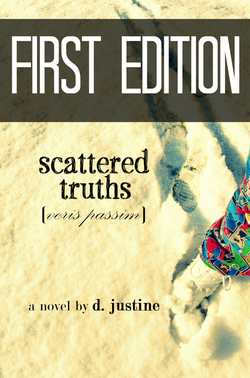 Originally published under the pen name d. justine, scattered truths (veris passim) was Dani's first attempt at being an independently-published author. In the two years since her debut novel became available for purchase, Dani has learned much more about self-publishing, and made the decision in January 2013 to pull the first edition of scattered truths off the shelves in order to polish it further. Plans are underway to have the second edition available for purchase -- under her real name -- in Winter 2014. "Scattered Truths (veris passim) is the best work I've ever seen from D. Justine. To most of you that doesn't sound like a lot considering this is her debuting novel- but I've been reading work by D. Justine for as long as I can remember. Her work has always delighted me and Scattered Truths is no different. Full of memorable quotes and minute-by-minute thrills Scattered Truths will be a book you want to read again and again. Georgia Freebird, the main character is an outsider- or a person born with special abilities. In particular Ms. Freebird seems to be incapable of any type of deceit, cannot forget a single detail of her life and has some ability to sense how others are feeling. Her other gift- and probably the coolest one- is that she has "mood eyes" that change color depending on her mood and thoughts. Georgia's sister is a mindreader. D. Justine dives into both the advantages, and disadvantages of having such gifts, and crafts a beautiful story about what it means to be a gifted human. My only regret is that, like any good story, it had to end." "This book proves that d. Justine is a gifted human as are her characters.I loved them all and I loved that they loved each other. Strong values were clearly expressed. It is a very positive representation of young adults. The dialogue is brilliant and you wanted to be part of it for many more Chapters.. This book has it all: fun, excitement, romance, imagination,and even a conspiracy theory. I look forward to a sequel and/or a new novel written by this very talented young author. A movie would be good too!" "I'm not an avid reader by any stretch of the imagination, but you wouldn't have known that if you were a fly on the wall of my house when I picked up "Scattered Truths". THIS BOOK WAS BEYOND EXCELLENT!! The characters from the very beginning were engaging and I wanted to get to know them more page by page. I'm usually quite bored with books, hence the not being an avid reader, but this one held my attention from start to finish. I was also very sad when the book had to end. I wanted to spend more time with these characters and was sad that our time together had to end. "Scattered Truths" is a must-read for the person who wants to be swept away from their every-day into a world of truth, love & true depth of spirit. Bravo to D. Justine on a timeless classic & please please please write another book very soon so I can have something worthwhile to read!! Thanks in advance..."
"I just loved the story! The first chapter was a bit rocky while the groundwork is being laid, and characters introduced, but once you get that established, it is impossible to put down! You'll fall in love with the characters, hate one or two, and relate with the real to life feelings, thoughts and emotions. The Fall and Christmas theme highlights the joys and happiness that surrounds that time of year. There's something for everyone in this story. Romance, humor, the moments that make you cry, and even a little Sci-Fi. Not to mention a slight twist in how you originally thought it would end. Again, a great story, with easy to relate characters. Cannot wait till there's more d. justine volumes to add to my library. You won't be disappointed with this great read!" "scattered truths (veris passim)was an incredible read. This book went strait to the top of my favorite books list, instantly. I fell in love with the characters and their stories. d. justine did a wonderful job of making everything feel so real, just like you were right in the middle of the story the whole time. I felt like I was best friends with all the characters. I was captivated just within the first few pages and couldn't put it down until I was finished. I can't wait for another book by this author!"